Here’s a hint: It’s small, the size of a lentil bean, is confirmed by peeing on a stick, and is currently making me extremely nauseous. That’s right, you smarty pants, you…I’m pregnant! Are you surprised or just plain old happy for me or both? Well, I’m beyond surprised, since this baby is a big surprise, to say the least. From our engagement, Jonathan and I always felt that we wanted three kids. While I was pregnant with our second, however, we felt the urge to pray about having that third baby. As we prayed, we both felt that while God was certainly giving us permission to have a third, He was also cautioning us about the decision. We were a little sad, but we decided to heed God’s warning and caution. Over time, I became completely comfortable with that decision. Two is pretty easy. I’ll take it. Then, wouldn’t you know, about 6-7 months ago, I got baby fever. Bad. I was distracted, obsessing, dreaming, scheming even (yes, I’m referring to seducing my husband) about ways to have another baby. I prayed. Jonathan prayed. Same story. We still did not feel like moving forward would be the best thing for us or our family. I was laying in bed one night a few weeks ago, literally crying out to God. I felt so conflicted. On the one hand, I could see the benefit of remaining a 2-child family. I knew that 2011 was promising to be a big year for me personally, professionally, and in ministry. I could understand why saying “No” seemed wise. Yet, my heart really was longing for another baby. I couldn’t shake it, no matter how much I prayed and asked God to take away the desire. As I lay there in bed, crying, I actually told the Lord that I didn’t want to be pregnant. That I wanted His will. That I wanted what He had for me and nothing less. The next morning, I woke up and checked my calendar and realized that I was 4 days late. 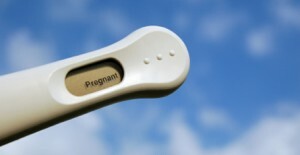 I called my friend and she convinced me to take a pregnancy test. I walked into the bathroom, cool as a cucumber, and actually said out loud, “I’m 87% sure that I’m not pregnant.” 6 to 7 minutes later, I walked back into the bathroom, only to have the wind knocked out of me. I. Could. Not. Believe. It…Pregnant. The stinkin’ stick said “pregnant”. I will admit that right then and there I had a little bit of a panic attack. I couldn’t breathe. I started crying. I called my friend back and she proceeded to talk me down and remind me of what a tremendous blessing this really was. Why was I so conflicted? Well, on the one hand I had been certain that the Lord had said, “probably not,” or at the very least, “wait.” I had spent hours in bed, just the night before, professing that I did not want a baby. I wanted God’s will. I read those words and started weeping and began thanking the Lord, for while I had confessed I wanted God’s will for me, His will for me was, in fact,to have another child because He had heard my cries and “granted me what I asked of Him.” Right then and there, I dedicated this little lentil bean to Him. So yeah, I’m already feeling puffy and sick to my stomach. The cravings for weird things has already begun. I’m tired and cranky, weepy and sleepy, but it’s all worth it. Nothing beats God’s surprises. Nothing. Thank you to all of you for sharing in my joy and excitement! Don’t worry, MR is not going to suddenly become a baby blog, but I will keep you updated along the way. God is good, isn’t He? What is one of the BIGGEST surprises God has ever blessed you with? How did you respond? How did it change you? OMG We are over here doing our “Happy You are Expecting Dance”! This is such great news – we can’t stop dancing…wooo hooo!!!! Thanks Ladies! We are doing some dancing over here too, especially Jonathan ’cause you know how he likes to get down. Thanks for sharing in our joy! This is so great!! How exciting!!! I love all those emotions! I also love having another friend to be pregnant with!! You guys are going to be a great family of five! I’m glad to have you to be preggo with too! P.S. When I read the words “family of five” my stomach dropped. Holy big family! Pray for us! Yeah! Love you. God’s will is sometimes to give us what our heart truly desires. You and Jonathan are such great parents. I can’t see why having another wouldn’t be great! Great people raising great kids to do great things for God’s glory. Sounds like a no brainer to me! Thank you friend. That is so kind. I am still amazed that God has entrusted one or two, let alone (almost) three children to me. I so desire for them to do great things for His Kingdom. Amen! In a way, I am connected to your blog… so congrats!!! God surprised me by giving me a new job. I tried, tried getting out of my old position, and when I finally submitted to His ways, He blessed me. Almost a year after my last interview, I literally got a call out of the blue from the head honcho who “offered” me a new position!!! Joyce, you are totally connected to this blog, just by reading! Really! What a great story and a great surprise you shared! How amazing. I’m sure you must have been floored and so awed by His goodness. So cool and such a great reminder that God is always faithful, in His timing. My biggest surprise is similar to yours. After adopting 4 children because we thought having a biological child was impossible, my wife became pregnant. Better than that, I am the father :) Wonderful surprise. Thanks Carrington. I’m glad you are sharing in my joy. When is your next baby going to appear, ya think? No pressure. It’s just that you make such beautiful babies. I hope this baby is like you described. I could use it. My second, my son, is a handful both emotionally and physically. I am hoping…heck, praying for a sweet mannered last baby, just like yours. Congratulations, Nicole!!! And, HA! I think it’s funny, because we have traveled exactly the same road; I’m just a little further down it than you. After #1, I said, “This is hard! That’s IT!” Then, after #2, I said, “That is REALLY it! !” Same with #3. (Both Grant & Wes were God’s plan, but not mine & Martin’s.) I was so, so, so, so truly done with pregnancy and more children after Wes. But, when he was about 2.5yo, I started changing my mind. I then went through a year of really longing for another child, to the point of weeping every time I thought about it, and Martin was like, “No. No. No. No.” Then, he was out of town, and I was driving somewhere with my three boys, and started weeping, weeping, weeping as I drove, and tears and snot and all, and with the boys listening, I just had to pray out loud and confess and realize that I had to GIVE IT UP, as the desire for another baby was becoming divisive in my relationship with my husband and with God. I 100% laid it down, to the point of committing to purposefully NOT letting myself think of it, choosing to put the thought aside and not even go there. About two days later, Martin came home from the trip, and asked, “Wanna try for #4?” I was floored. I LOVE this story. I had never heard that from you before. I find it so encouraging to hear that you went through something similar. Wow. I love how God uses even our own wants to draw us more into His own will, surrendering ourselves in the process. Amazing…and we get kids/babies out of the deal. What an awesome God! Nicole, This is wonderful news. You are a great Mom and I have learned 1 thing, God gives you bigger arms & a bigger heart with each child he places in your life. Love the Family of Five! Thank you Nicole! I am already starting to love this baby, whoever it is. Isn’t it so cool how that works? How cool is that? I’ve had those thoughts too…”God is out to get me!” and then lo and behold He blesses my socks off. It is humbling, wouldn’t you say and yet so like our God. So glad you are loving your career as a writer and being your own boss. What a tremendous blessing. Congrats Nicole, that is so exciting! I loved reading your story of how it came down! I had no idea you wanted another, last I heard you were done, but so glad the Lord has given you one more baby! Do you know your due date? I’m due in July again! I have a scheduled C-section for July 15. Your story is similar to mine and my struggle with the Lord in so desperately wanting a daughter, I ALWAYS thought I would have daughters (plural) so I am still shocked that I have two boys! Although I have to admit I have become fond of Thomas the train books and Spiderman underwear, and love my two little boys more than life! At one point I decided that the only way to control and make sure our third was a girl was to adopt from overseas! Until I found out how expensive it was. There went that. But of course I finally came to the point you came to, a little over a year ago, when I was able to really surrender the desire, I told the Lord that I gave him the desire of my heart and immediately his peace came instead of my frenzy. Then, two nights in a row (that night and the next night)I feel that He gave me two umistakable promises to give me the desire of my heart during my normal Bible reading time, from Psalm 20 and Psalm 21. I know without a shadow of a doubt that He is in the business of granting the desires of our hearts when it is good and right, so I will know that if this one is a boy, he has a very important reason for that. I will still believe the promise he gave me and just wait for it in an unexpected way! Congrats again, so excited for you!! What a great story and testimony of you standing on faith. I am so excited for you and your family. Heidie Gentes told me once that God just brings the exact right baby into our families at the exact right time. I know you are trusting Him for nothing less. Can’t wait to see how God exceeds your desires! Our fourth was unplanned. As in, all the baby clothes had been given away, I had already had three children in four years, we were convinced that we were *done*, and our youngest was only 7 months old. On New Year’s Eve (2002) my husband told me I was pregnant. I laughed, said “no way” and fell asleep. He begged me for days to take a test. Since I was still nursing, he had recently lost his job, and I was on the mini-pill I really, really didn’t take him seriously. Finally he came home with a test. I took it and cried for days. He was over-the-moon ecstatic. . .we went to church that Sunday, I handed it all over and all was well. I lost a friendship over it (“How can you be so irresponsible?! ?”) and had a lot of family “tsh, tsh” but ultimately, WE are not in charge, HE is. I can’t tell you what a blessing our fourth is. He is 7 now. . .I absolutely cannot imagine life without him. If God had left decisions up to us we would have missed out on SO MUCH. And yes, we got “fixed” after that and the baby-craving came back a few years later. We had made our decision though, when my husband had his surgery. I’m still not convinced that our family is “complete”, but this body is done having babies!!! We’ll see. congrats to your wonderful news…many blessings to your “family of five”! Congratulations!! So excited for you and your new family of five! i miss babies. i want another one, but the hubster likes our 1:1 ratio with the 2 we have now. So very excited for you! Our #3 was also a big HUGE surprise. He has been a joy and SO completely different from the first two. I have learned more, prayed more in these last two years than I ever thought I would. Sometimes I’ll get a glimpse of him in the rear view mirror and get overwhelmed with the thought, “What if he was never in our lives?” I can’t imagine it. He rounds us off and completes us in a way that I never thought possible. Next Next post: If God Had a Tagline…?